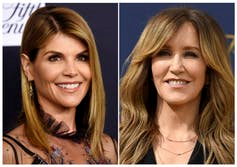 Actresses Lori Loughlin (left) and Felicity Huffman were among 50 individuals indicted in a sweeping college admissions scandal. Natasha Warikoo is an associate professor of education at Harvard Univerity. Her commentary was distributed by The Conversation, a nonprofit news service featuring analysis and commentary from academic experts.